Just regular folks. : Disney World. After we disembarked from the cruise, we split up into two groups. Because we thought that Edda could only manage one day at Disney World and because we had only one car (my parents drove in from MD) which seated only four; Edda, Jeremy, Mom and Dad headed towards our hotel in the car (with a stop at Cape Canaveral) and Donald, Vince and I headed to the Magic Kingdom via shuttle bus for an extra day at the park. 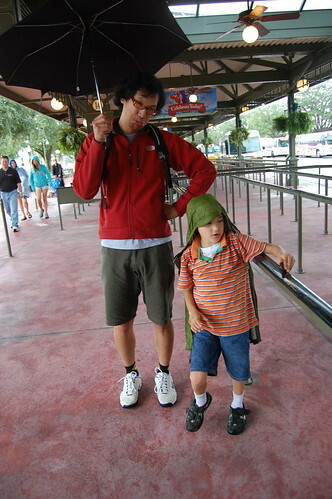 But by the time we got to the Magic Kingdom, it was pouring rain and Vince had had one of the worst meltdowns I had seen in a long, long time. So we ditched the idea of going to the Magic Kingdom and hung out eating chicken tenders at a hotel restaurant, rode the monorail and ended up taking naps in the hotel room. The next day, all seven of us headed out together to the Magic Kingdom for our one day at the park. I know lots of people spend 5-7 days at the park, but really, we were already operating on Disney overload - so only one day it was. We stayed in a Disney hotel, but it wasn't one of the closest ones - so we made this elaborate plan in which some of us would go back to the hotel because we were sure Edda would tire out after a few hours. But Edda lasted in the park from 10 am to 7 pm. 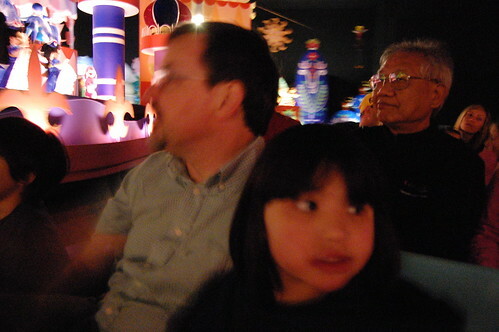 She went on almost all the rides with us. We had a great, relaxing (!) day at the park. 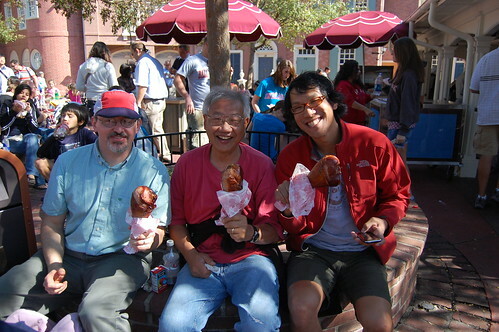 The highlight of the day was the trio of turkey legs that everyone feasted on. This was how we celebrated Thanksgiving! "I can't stand one more minute of this!" I am SO behind with my blogging friends - HOW FUN!!!! It is good to catch up on you and your family.....give Edda a big hug from me!